“Serving and promoting the individual student; unifying all that is Auburn,” is the slogan of the Auburn University Student Government Association. 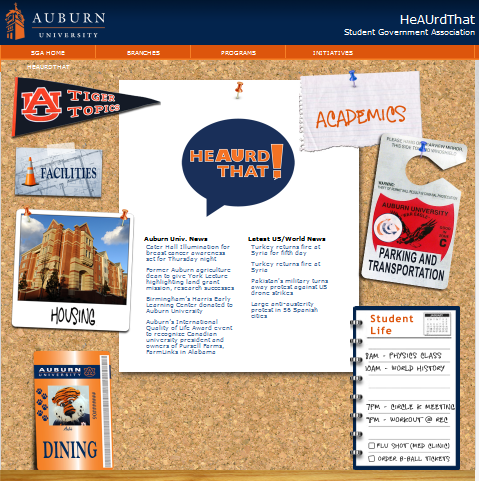 The Auburn University Student Government Association aims high for honesty and transparency with their initiatives for Auburn students. But do students feel like they know enough information about what’s happening on campus? They should now more than ever. Not only did campus senators recently host, HeAUrd That!, a concourse event intended to raise awareness of their services, the SGA also has launched a HeAUrd That! website where students can voice their questions and concerns. Complaints about parking? Academics? Facilities? Dining? The HeAUrd That! website hears all. Part of that potential includes involving more students not only in the benefits of student government, but in its function. In addition to the pizza and candy available at the HeAUrd That! event were fliers with information about how to get your feet wet in the SGA without a huge time commitment. Applications to be a High School Leadership Conference Counselor will soon be online, for example, and Auburn Dance Marathon is still raising money for its February event.